These panelized light weight roof systems are made with 2x4 purlins and 1/2 roof sheeting and they all fail in fire too fast. They should be made to use fire treatments that slow the advance of fire. It’s ridiculous that with today's advancement in fire technology we still allow this type of roof that threathens firefighters lives. For the builders that still build with cheap light weight roof systems without Class Fire Protective, Roof Coating like Global Encasement and Mighty Fire Breaker™ job site spray their buildings should be allowed to burn. Insurance underwriters that recognize a builder who embraces Class A Roof Coatings and Mighty Fire Breaker™ job site spray should reduce risk premiums because those buildings promote resilience that defends the buildings and our brave firefighters. Old or new buildings can replace the roof with Global Encasement and Mighty Fire Breaker™ even if the building is 20 years old. Enough Is Enough, Builders Must Be Forced By Their Insurance Companies to use today best practices for fire defense or be charged higher premiums than the builder that do because we have to defend our brave first responders and firefighters better. 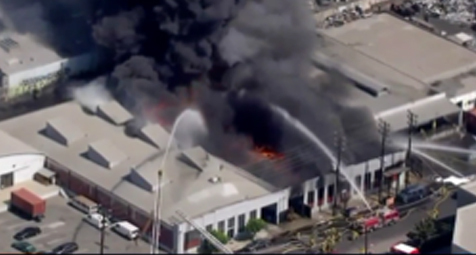 LOS ANGELES (KTLA 5) - Three firefighters were hurt while battling a massive fire at a commercial building in Boyle Heights that sent plumes of heavy smoke over the area on Wednesday afternoon. The blaze started just before 1 p.m. in the 80-by-100-foot one-story building on 2881 E. Pico Blvd., the Los Angeles Fire Department said. A clothing warehouse called Passion Imports is listed under that address. Some 150 firefighters were deployed to the site and managed to extinguish the flames in about two hours, LAFD spokesman Erik Scott said. He said at some point, the roof partially collapsed. While it was initially reported that four were hurt, the Fire Department later clarified that one firefighter fell through the burning roof and sustained "painful though non-life threatening burn injury," and two others who rescued him were burned less severely. "He immediately tried to lift himself from peril, and was quickly assisted in doing so by his colleagues," a news release from the Fire Department said. "They were all taken to the hospital, the first firefighter is in critical condition and the other two are in fair condition", Scott said. No other injuries were reported.